The Companion by Pad Brotherton is a story about the rare bond of friendship. Will Westfield, a doctoral student, answers an advertisement to become a companion. Will is excited about the prospect of making easy money while studying. Will meets Libby Stamos at her upscale home, not really knowing what to expect. Libby explains to Will that her neighbor and closest confidant, Stressa, has recently passed away. Feeling the loss of friendship, Libby desires someone to talk and spend time with, a companion to share and keep her secrets. Libby takes an immediate liking to Will and hires him on the spot. Over the span of a few months, an exceptional and unique companionship is forged, changing Will’s life forever. “Everything about my life had to be rewritten.” Pad Brotherton tenderly captures the spirit of friendship in The Companion. Although a novella, the narrative has a depth of meaning and sincerity. Quite honestly, The Companion is one of the best books I have read in a long time. It is written with the eyes of the soul and the breath of the Spirit. Although the main characters are vastly different, the relationship between them develops with eloquent ease. There is an unforgettable scene between Libby and Will. Brotherton blends and nurtures their friendship gradually, yet with an everlasting, life-altering impact. The narrative is built upon the art of listening. To share and be heard is the heartbeat of the story. One of my favorite lines is: “My questions seemed to hang motionless like drapes on the windows.” The Companion exposes the brokenness of betrayal and the courageous journey to become whole again. The Companion is a literary fiction novella written by Pad Brotherton. Will Westfall could hardly believe he was there in Switzerland, delivering a personal letter from his employer and friend, Libby Stamas. The trip from Colorado where he lived took over fifteen hours, and the fact that it was the dead of winter had made the voyage even more arduous. So much had happened since he answered a help-wanted ad for a companion the preceding spring. The grandeur of her home rather intimidated the graduate student who needed to supplement his grad stipend while he worked on his doctorate. The job involved spending ten hours a week with Mrs. Stamas, a widowed woman in her sixties. They would not be watching TV, but playing games, sorting stored goods in the attic, and discussing their lives and beliefs would work just fine. Something about Will made it easy for Libby Stamas to offer him the position. A day later, they began. The Companion is a philosophical treat as the older woman and her paid companion become closer in a matter of months than many friends with decades behind them. Will travels to Switzerland to meet with her estranged twin sister and rushes back home, wondering if the terminally ill woman will still be alive when he arrives. Seen in retrospect, one can sense the depth of the connection between the two. Brotherton’s engaging plot has much to do with faith, belief and forgiveness, and his characters are credible and complex. The Companion is well written and compelling. One can’t help but become wrapped up in the story of the hired companion who becomes so much more. The Companion is highly recommended. 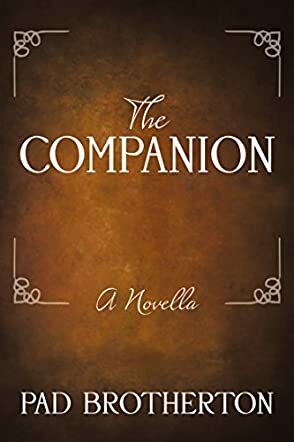 In The Companion by Pad Brotherton, Will Westfall, a thirty-year-old student studying for his doctorate, finds a job as a companion. Libby Stamas, whose best friend passed on, is now looking for a person to serve potentially as her confidant. She places an advertisement for the position. At first, Libby and Will’s meetings appear casual, just one person having simple conversations with another. That is until Libby starts disclosing details of her painful past. Will also shares information about his troubled relationship. As they continue meeting, a friendship develops between the two with each revealing details of their lives that they may not have otherwise considered disclosing. Through the whole experience, Libby shares parts of her faith with Will, including her thoughts on life after death. Pad Brotherton explores the themes of friendship and faith in The Companion through two unexpected characters. Libby and Will have many opposing features including their age, gender and wealth differences. These dissimilarities help in creating a fascinating and unique plot. There are many unforeseen events in the book such as Libby’s revelations which make the story even more compelling. In some places, the story is emotional as it explores the deeper feelings of the two main characters. Since the focus is on Libby and Will throughout, this simplifies the plot as supporting characters only appear briefly. Other main relationships that the two have been involved in are explored. In the end, the dialogues in the book serve as points of reflection mostly on life choices and matters pertaining to faith.